Y’all remember last Christmas I showed you how to repurpose Christmas Cards into cute little Christmas gift boxes? 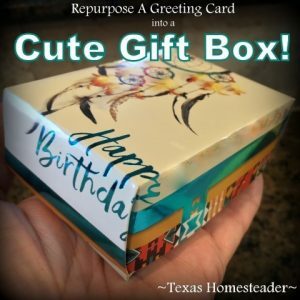 Well I thought I’d point out that you can use any greeting card to make these gift boxes. A friend of mine was celebrating a birthday recently. I decided to gift her some homemade Lavender/Rosemary soap, but how to package it? 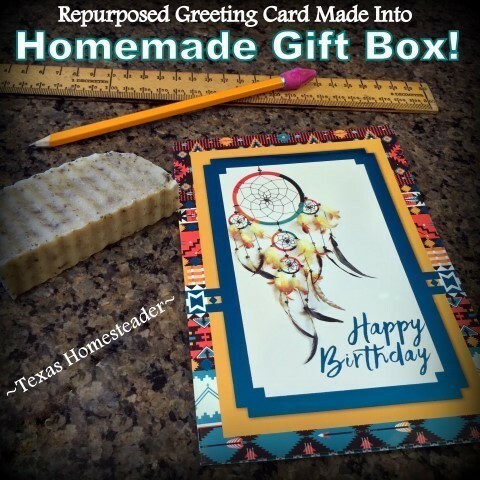 Quick and easy fix – I pulled the birthday card she gave ME last year and decided to turn it into a cute little gift box. Won’t that be the sweetest idea? Plus it’s the perfect size for a bar of homemade soap! You see, we typically gather monthly to celebrate whomever’s birthday falls in that month. So I’d saved all the birthday cards from my own party last year. I typically use the pretty fronts of the cards for gift tags. But I thought it would be a cute idea to actually use the birthday card my friend gave me to make her gift box now. I carefully separated the front from the back of the card. 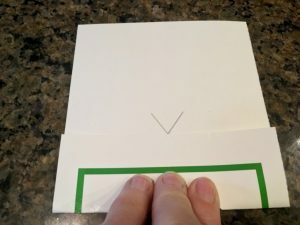 Then on the flipside of the front half I laid a ruler from the top corner of the card to the bottom corner across and drew a light pencil mark in the center. (I draw it lightly, as I’ll be erasing it when the folds are complete.) Then I did the same thing on the opposite side of the card. 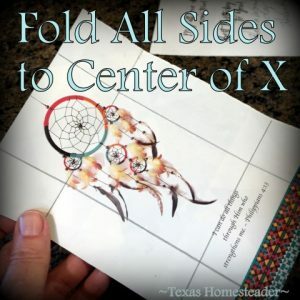 This gives me a light pencil ‘X’ in the exact center of the card. Now I focus on the lines that go along the long sides of the cards. I cut from the bottom corner along the longer side just to where the very first line intersects with it. I do this on either side of the long side, both top & bottom. 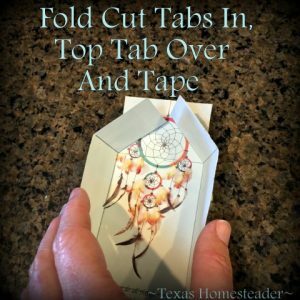 This will form the tabs which are then folded in & the longer middle tab is folded up & over. I’ll tape it down to form my box. Hooray – the top of my box is complete in short order! Now it’s time to use the back half of the card to make the bottom of my gift box. But I need to make it just slightly smaller than the top so they’ll fit together. 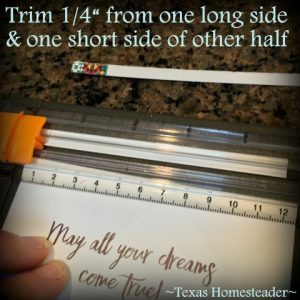 So I first trim a small quarter inch from one of the short sides and one of the long sides of this back section of the card. Then I follow the exact same procedure as the top. 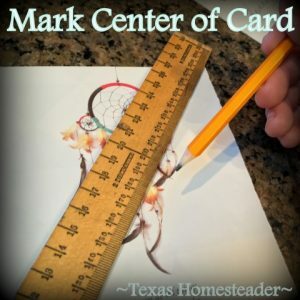 I mark a light pencil mark in the exact center of the card, fold, crease and cut the tabs. Then I fold & tape exactly as I did for the front of the card and voila! One cute little gift box! My friend loved it, and she especially loved that I used the card she’d given me last year. The design of that card was already special to her, that’s why she bought it in the first place. Plus I’ve been able to repurpose something that would have just been thrown away into a beautiful way to present my heart-felt homemade gift! 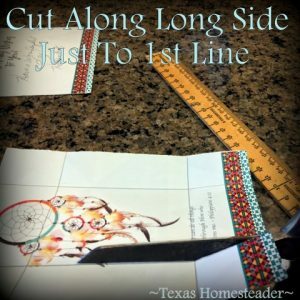 This entry was posted in Blog Posts and tagged Environment, Frugality, Holidays, Make-It-Yourself on April 8, 2018 by Texas Homesteader. I love this idea & I have all kinds of cards saved up. Thank you for another idea for using them!